Complessitá is a performance that reverses the traditional human-machine interaction to reveal the beauty of complexity and our role within it. 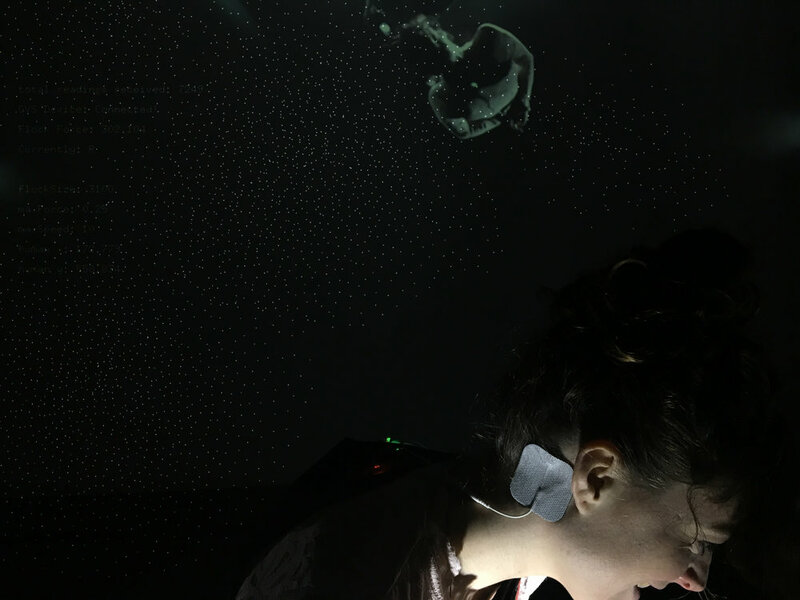 At the crossroads of arts, technology, science, and biohacking Complessità brings us into a new dimension where technology collaborates with a moving human body as the operator and not just the executor. 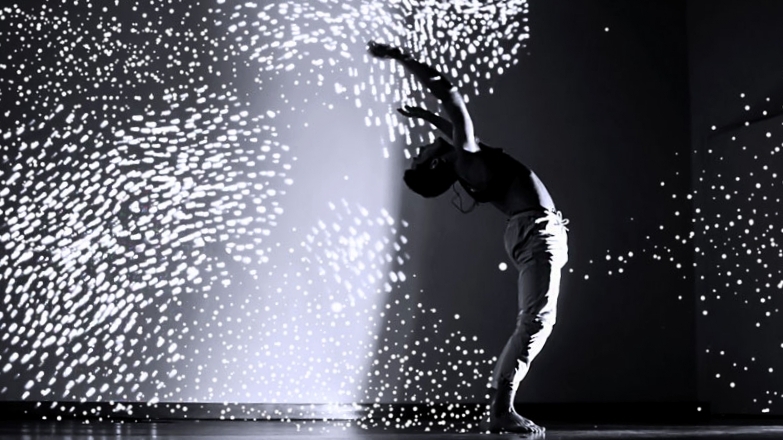 Our role within complexity is explored through a transposition of data from virtual to biological, using a Galvanic Vestibular Stimulator (GVS) that ties the performer's body direction to the direction of a flocking algorithm projected as a particle display. The dancer is forced to sway according to the flock’s movements, thanks to GVS that sends electric messages to the nerve in the ear which maintains balance. By altering the performer's vestibular sense, their perception of how they are oriented in space changes to align with the flock. This performance represents the continuity of humans and the natural world. Contrary to the presumptions of anthropocentrism, we are all at the mercy of complexity; we are part of a whole, with no center to which we are fundamentally tied. The ultimate goal of this piece is a cultural shift from egocentrism to ecocentrism, and the use of technology plays a symbolic role in changing the paradigm from self-assertion to integration with a whole greater than the sum of its parts. This piece questions authority, power, and human behavior. 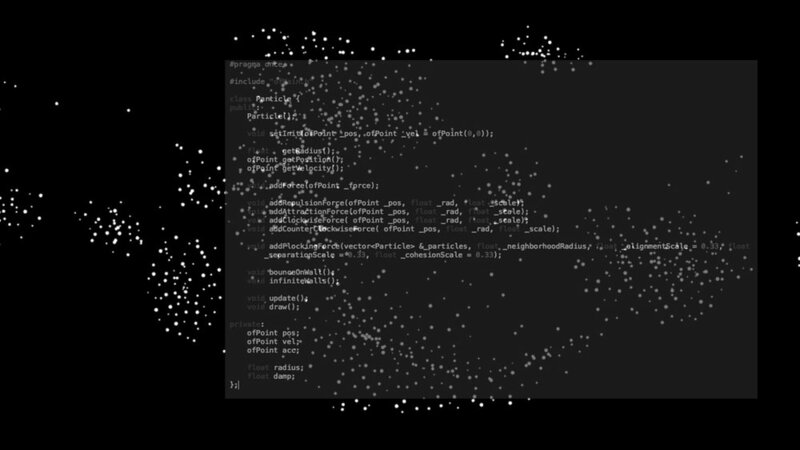 Computer science and sensing technologies have introduced multiple ways to transfer data from physical to digital contexts, but rarely the opposite.Therefore, we see interactive performances where A/V components are manipulated in a one-way type of interaction. In Complessità, the machine loses its unilateral position as a receiver of human instruction and instead participates (finally) in an expressive, mutual work of art. Singularity and collectivity operate across both biological and computational contexts, resulting in symbiotic human-technology relations. Complessità is a collaboration with Enrica Beccalli. Complessità has most recently staged as the closing act of the Tribeca Film Festival Interactive, with performer and choreographer Tony Bordonaro dancing. Complessità has also been staged it at the closing event of the Creative Tech Week with the performer Lynn Neuman, artistic director of the Artichocke Dance company and at the Digital Design Days (Milan) with dancer and performer Anouk Froidevaux. Credits: Aisen Caro Chachin, technical support and GVS board design / Paolo di Prodi, technical support – Tony Bordonaro, Performer / Joe Saavedra, advisor and tech support / John Sharp and Melanie Crean, advisors.